“We want to think about the issues of new evangelization in our Church within the context of the general discussion of the Universal Church. This issue is also tightly connected with the issue of missionary work, which was extensively discussed at this year’s UGCC Synod of Bishops. We will focus on relevant issues of the pastoral mission among our faithful who had either left Ukraine or were born or settled in these countries. 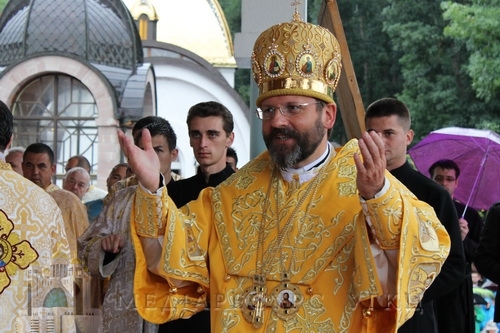 “We will share our experiences, exchange ideas and delineate the directions of our activities so that they satisfy the pastoral needs of the faithful,” stated His Beatitude Sviatoslav in his epistle to UGCC priests in Western Europe on the occasion of calling together a Forum of UGCC Clergy in Western Europe. However, the main objective of the above event, according to the UGCC Primate, will be the joint prayer, networking and closer collaboration of UGCC priests in Western Europe. As is announced, with the blessing and the participation of His Beatitude Sviatoslav and UGCC bishops in Western Europe, during December 2-6, 2013, a Forum of UGCC Clergy in Countries of Western Europe will take place in the Portuguese town of Fatima, a miraculous site. The Forum topic is: “Evangelization: do we believe that it is possible?” The gathering foresees a discussion and evaluation of the UGCC pastoral situation in Western Europe, and will have as its primary objective the establishment of a closer collaboration among the various UGCC structures in Western European countries. Over ten presentations will be made by individuals experienced in liturgical life, catechization, education, etc. Location of the Forum: «Domus Pacis» in Fatima (Rua S. Vicente Paulo, 322495 - 438 Fátima - PORTUGAL). The most convenient way to get to Fatima is to arrive by plane at Lisbon Airport, and then to take a bus to the stop Rios across the way from the Lisbon Zoo Park. The bus company Rede-expressos offers regular buses to Fatima (approximate duration I hr. 20 min. ; cost 10 €). After receiving the registration forms, especially upon examining the projected arrival at Lisbon Airport, the organizing Committee will consider the possibility of reserving private buses for a more convenient connection from the airport to Fatima. Information will be available on the website after October 15, 2013.